Exquisite design, rich mahogany finish and smart storage features make the Ashburn Collection a true design wonder. This matching floor cabinet offers abundant storage space for those additional bathroom items. 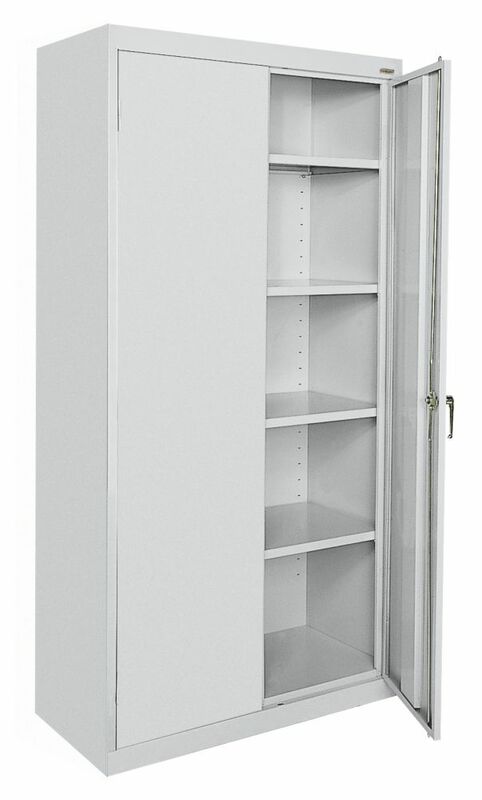 It features 1 open-top shelf and 1 adjustable shelf that sit behind a single door within the enclosed storage area. Like the other Ashburn items, this cabinet is accented with oil-rubbed bronze hardware to complete your collection. Classic 36-inch L x 72-inch H x 18-inch H Storage Cabinet with Adjustable Shelves in Dove Grey Great for the office or warehouse, this Classic Series garage cabinet provides secure storage for office products and other essentials. Features include four fully adjustable shelves on 2-inch centres, plus a raised bottom shelf, a three point door lock system and three sets of hinges per door. Classic 36-inch L x 72-inch H x 18-inch H Storage Cabinet with Adjustable Shelves in Dove Grey is rated 4.4 out of 5 by 87. Rated 5 out of 5 by HappyCustomer from Highly recommend Received delivery to home today. Well packaged; in perfect condition. Very well made. The only “assembly” required is to attach the handle and latching mechanism with two small screws. Exactly what we were looking for. Good work, Sandusky. Rated 5 out of 5 by Milton from Great product. Came almost completely assembled, all I had to do was install the lock rods, door ... Great product. Came almost completely assembled, all I had to do was install the lock rods, door handle and shelves. Rated 5 out of 5 by ZigZag from I bought three of these Cabinets Classic Series 72" H x 36" W x 18" D- I also purchased 3 Afterma... I bought three of these Cabinets Classic Series 72" H x 36" W x 18" D- I also purchased 3 Aftermarket dolly's that fit under them. The Cabinets are made Tough! I was actually surprised how nice they are. I have no clutter laying around in my garage now! I HAD SOME OLD STICKERS LAYING AROUND AND I PUT THEM ON THE CABINETS! Nobody's ever going to see them but it made me happy just to personalize them like that. Make sure to buy the dolly's- It makes moving them a round a Breeze you guys! These are worth every penny!